Our favorite time of the year is upon us! Come and experience the live camels, colorful puppets, parrandas, and dancing on this magical day. School groups, community members, local businesses, and families are encouraged to participate. Early registration is strongly recommended. For more info and to register, click here. 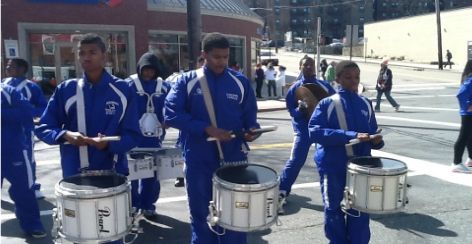 More than 10,000 people participate in our Three Kings Day Parade each year! Our volunteers accompany school groups along the route, distribute crowns to parade participants during the parade, and engage with children, families, and our general audience throughout the parade route. Teach your students more about Three Kings! Teachers and educators are encouraged to utilize our Resource Guides in the classroom, and engage students in a fun learning exercise. These amazing individuals, chosen by community members from our Steering Committee, have demonstrated meaningful service and commitment to El Barrio and Latino communities throughout New York City. See below for more information on our 2015 Honorees! This year, we are excited to unveil new headdresses for our many honorees. Designed by Artist Lina Puerta, and Costume Designer Lucy Karanfilian, the pieces honor cultural Latino icons, such as Celia Cruz, Antonia Pantoja, Pedro Pietri, Rafael Tufiño, and others. Celebrate las fiestas with El Museo! Our Super Holiday inspired activities include crown-making, a lively parranda sing-along, and a concert by the inspiring music of El Sistema. BombaYo emerges from the streets and schoolyards of the Bronx, where salsa and hip-hop were born. 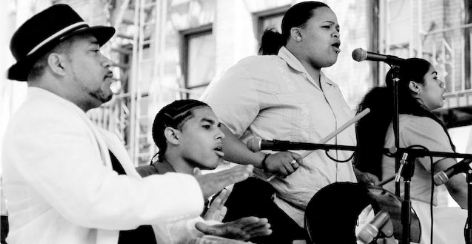 Under the direction of Jose L.Ortiz, aka Dr.Drum, and Melinda Gonzalez, BombaYo’s young people bring new energy to a centuries-old Afro Puerto Rican music and dance tradition. For more info, visit www.bombayo.org. 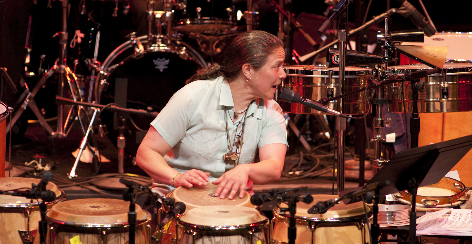 Multi-percussionist, Bandleader, Producer, and Educator, Annette A. Aguilar has performed, toured and shared the stage with artists such as Stevie Wonder, Darlene Love, Tito Puente, The Grateful Dead and many more. In 1992, she formed Annette A. Aguilar & StringBeans, a Latino-Brazilian jazz band. Celebrating more than 20 years of trajectory, the band was selected three times as Latin Jazz Ambassadors for the U.S. State Department via The Kennedy Center and Jazz @ Lincoln Center, where they traveled to Africa. For more info, visit www.aguilarstringbeans.com and follow us on Facebook! Additional support provided by the Manhattan Borough President, Scott Stringer; the New York City Department of Parks & Recreation; and the New York City Council’s Manhattan Delegation. El Museo del Barrio’s Education & Public Programs are made possible by Altman Foundation, ConEdison, Edmond de Rothschild Foundations Network, K-mart, Mount Sinai Medical Center, the Milton & Sally Avery Arts Foundation, Inc., The New York Yankees, and White Rose. With the support of public funds from the New York State Council on the Arts, the New York City Department of Cultural Affairs in partnership with the New York City Council: Speaker Christine Quinn, Council Members Gale Brewer, Daniel Dromm, Inez Dickens, Daniel Garodnick, Robert Jackson, Melissa Mark-Viverito, Annabel Palma; The Hon. Domenic Recchia, Jr., Chair of the New York City Council Finance Committee; the New York City Council’s Manhattan Delegation; Manhattan Borough President, Scott Stringer; and the New York City Department of Parks & Recreation.